The price of love continues to go up, especially in the media business. On Monday, ESPN and Turner Sports extended their marriage with the NBA for nine additional years, meaning ABC, TNT and ESPN will televise NBA games beginning with the 2016-17 season and running through the 2024-25 season. The cost of such matrimony? Multiple outlets (first reported by The New York Times) said the the value of the deal was $24 billion over nine years, making the average yearly payments rising from $930 million to $2.6 billion. Sources told the Sports Business Journal that ESPN will account for about $1.4 billion of the deal per year, and Turner's payment will average around $1.2 billion. By the end of these new agreements, the NBA will have been in business with Turner for 41 years and ABC/ESPN for to 23 years. Along with financial analysis from Michael McCann and Ben Golliver on what the rights deal means for the league and fans, we offer a quick question and answer session on how this impacts you as a TV viewer and what it means for each broadcast partner. When and where can I see games starting in 2016-17? The new media rights agreement has ESPN/ABC televising 100 regular season games (an increase of 10 over the current deal) while Turner will air 64 games (an increase of 12 games). The games will continue to air on Wednesdays (ESPN), Thursdays (TNT), Fridays (ESPN), and Sundays (ABC/ESPN). NBA TV will air games Sunday, Monday, Tuesday and Saturday. The NBA Finals will remain on ABC. Why did ESPN want to do this deal? What are the highlights for ESPN? Here’s an eye-catching number: ESPN will add 750 hours of NBA-focused programming on linear and digital platforms as part of the deal. That means ESPN will be giving the NBA similar treatment to the NFL. Skipper said the network will make “a year-round commitment to the NBA” so look for added content around the draft, training camp, Summer League and the trading deadline. As part of this deal, beginning with the 2016-17 season, at least 20 NBA Development League games and NBA Summer League games will be seen on the ESPN television networks. The network also reached a multi-year extension for WNBA rights through 2025, which will include increased in-progress highlights on linear and digital platforms. Here’s the ESPN press release that highlights the multiplatform rights it acquired. Why did Turner Sports want to do this deal? The company considers the NBA part of its foundation and it made moves over the last 24 months (hiring NBA writers for Bleacher Report, for instance) to staff up on NBA content. The NBA gives Turner the opportunity to win key demographics on Thursday night. What are the highlights for Turner? Turner adds 12 regular season games airing on TNT that will air on non-Thursday nights during the second half of the regular season. There are also expanded digital media rights including NBA content for Bleacher Report. The network will remain the home of NBA Opening Night and also keep NBA All-Star Weekend. Turner will continue its business relationship with the league to manage the NBA Digital portfolio, which consists of NBA TV, NBA.com and League Pass. Here’s a press release that highlights the multiplatform rights Turner acquired. What does ESPN’s current sports portfolio look like? Thankfully, one of the members of ESPN PR was kind enough to tweet out the Empire’s assets. Will your cable bill go up because of this? What future technologies should we pay attention to here? ESPN and the NBA said they will partner on a new “over-the-top” offering that will allow for transmission of games digitally. Both ESPN and the NBA said details for the new offering will be announced at a future date. “The NBA has a long-standing tradition of embracing technology and working with us to create new business and new products,” said Skipper. Why did the NBA continue with its existing partners and not open its rights up to market? 1. NBC Sports has bulked up its hockey coverage with a pair of solid hires from Canada. 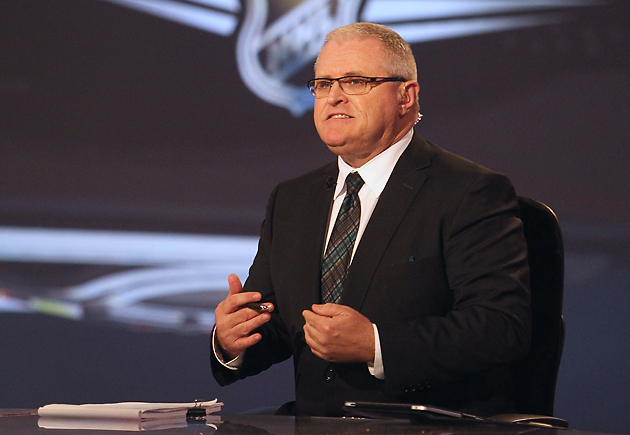 The network has added Bob McKenzie, the longtime TSN Hockey Insider, as a full-time contributor. McKenzie will appear regularly on NBC and NBCSN including as an in-studio contributor to NBCSN’s Wednesday Night Rivalry telecasts. He’ll also do on-site commentary at NHL All-Star Weekend, the Stanley Cup Final, and NHL draft. NBC has also added TSN Hockey Insider Darren Dreger. McKenzie and Dreger will continue in their respective roles for TSN in Canada. It came on Saturday at Ole Miss. 3. Remarkably, San Francisco’s 18-inning win over Washington on Saturday in the National League Division Series was not the longest game Fox Sports 1 announcer Matt Vasgersian has called during his career. “The longest game I was ever behind the mic was one that scarred me for a while -- a 22-inning Rockies/Padres turd (April 17, 2008),” said Vasgersian, who called Padres game for seven seasons before moving onto the MLB Network. “There were three separate seventh-inning stretches -- totally miserable. I forget exactly when it happened but my partner Mark Grant and I just gave up at one point and started babbling about anything that came into our minds like entire chunks of 'Slap Shot' and 'Trading Places.' A 9-inning Rockies/Padres game back then was dull -- 22 innings made you feel like you needed a shower and a fistful of ibuprofen." I asked Vasgersian what viewers should know about the challenges of calling a game that lasted 6 hours and 23 minutes. “One of the challenges of doing a game like that is never giving any indication that the endlessness of it is getting to you - which in a game with stakes as high as that one wasn't a problem,” Vasgersian said. “Had that been a mid-week matchup in June it would have been easier to be cranky come the 13th inning or so, after another small village was left on base. "From a bookkeeping standpoint, managing a clean scorecard gets tough. Something simple like forgetting to scratch off a starter or failing to read your own scribble over a double-switch can drive you nuts. As the night wears on and the effects of the caffeine ebb and flow the penmanship starts to look like that of a glue-eating kindergartener (not far off from what we sounded like at that point either)." 3a. Along the same lines, I asked Brad Zager, who produced the game for Fox Sports 1, what he saw as the biggest challenge for his crew. “I think our biggest challenge was making sure we were covering the game and preparing for the game to end any inning,” Zager said. “We tried to reset the game at the beginning of each inning with either a graphic, video package, or just Matt and John recapping where we are and how we got here. But at the same time in the breaks remind a crew that had been working a really long day what all the scenarios were, and how we would cover everything if the game ended in this inning. "When you get past just long and get to historically long, you want to make sure that you are letting the viewers know that this isn't just another long game, but a game that has a chance to be one people will be talking about for a very long time. I think that's where Matt and John really excelled -- Matt setting up John on what it's like for the players on the field and in dugout in a game like this. "What was great from my end producing the game was the support our crew got from back in Los Angeles, making sure we had everything we needed from research/stats to helping us further the story by going back to the studio when they got the footage of the Braves-Astros 18 inning LDS [in 2005]. 4. MLB Network said it averaged 279,000 viewers for its primetime broadcasts this season, up six percent over 264,000 viewers in 2013. The MLB Tonight studio show averaged 140,000 viewers, up seven percent over 2013. 4a. MLB Net’s telecast of Derek Jeter’s final home game averaged 837,000 viewers and peaked with 1.6 million viewers from 10:15-10:30 p.m. ET, the network’s most-watched regular season game ever. 4b. ESPN’s telecast of the Giants’ win over the Pirates was the most-watched Wild-Card Game in history (which dates back only to 2012) with an average of 5,591,000 viewers. 5. Yesterday I reported Greg Anthony, Grant Hill and Chris Webber will form a three-person rotation as TNT’s top NBA analyst alongside game announcer Marv Albert. Also as part of that column: Why Jay Bilas re-signed with ESPN and Shelley Smith on her breast cancer battle. 5a. NBC Sunday Night Football production staffers put together a touching tribute by wearing the jerseys of Bengals lineman Devon Still, whose four-year daughter has cancer.